Each year, Colorado School of Mines Alumni Association proudly honors exemplary members of the Mines community with several awards. Alumni nominate their peers for each award, and the winners are chosen by an awards committee made up of alumni members. We would like to congratulate the 2016 winners and thank those who submitted a nomination. Visit minesalumni.com/awards to view past recipients or to nominate alumni for 2017 Alumni Association awards. Presented to a student for their efforts in strengthening and embodying the spirit of the alumni association, the 2016 award was given to Hyung (Tony) Kim, class of 2017. Tony is a petroleum engineering student and plans to graduate this spring. He is president of the Student Alumni Association, where his greatest accomplishment has been helping to establish an alumni/student mentor program. The pilot program called “Mentorship @ Mines” launched this fall. Tony is also a Blue Key Honor Society member and was one of the Duane J. and Marcine M. Fritz Scholarship winners in 2016. After graduation, Tony would like to work as a reservoir engineer and further his education by earning an MBA. He ultimately would like to start-up and operate his own oil and gas company. Jimmy B. Taylor ’76 was selected for this award for making an outstanding contribution toward improving the image and enhancing the reputation of Mines. Jimmy graduated from Mines in 1976 with a bachelor’s degree in engineering and math. He serves on the alumni association golf committee and founded the Oklahoma City golf tournament in 2010, which he still chairs today. His efforts with the golf tournament have helped raise awareness of Mines in the Oklahoma City community, expand the local M Club and generate a Mines academic and athletic scholarship for students from the area. Jimmy also took a leadership role in fundraising for the Marv Kay stadium project as a member of the first football team that Marv Kay coached in 1969. He also acts as an admissions representative. Jimmy currently works for Johnson Controls as an energy solutions development engineer. Presented to an alumnus or alumna who has contributed meritorious service on behalf of the alumni association, the 2016 award was given to Norma Mozee ’83. Norma graduated with a bachelor’s degree in mineral engineering mathematics and a minor in geophysics from Mines in 1983, and earned her master’s degree in global energy management from the University of Colorado Denver in 2010. Norma serves on the Mines Magazine editorial board and has been instrumental in the development of the “Women at Mines” interest group, working with Admissions, SWE, WISEM and alumnae on ways to increase the number of women students attending and thriving at Mines. Currently, Norma is the principal and founder of Afinidad Americas, LLC, an international business strategy and advisory consultancy focused on energy services companies. Carol L. Skelton ’14 was selected for this award, presented to a young alumnus or alumna whose accomplishments have reflected favorably on the school and the alumni association. Since her graduation in 2014 with an environmental engineering degree, Skelton has been working diligently on some of the largest, most technically challenging infrastructure projects in Denver. As a civil engineer at Jacobs in Denver, she designs intricate drainage systems and complex hydraulics models in her day-to-day, and devotes her evenings and weekends to volunteering, hiking and family. She is an active member of the Women in Transportation Seminar and Water Environment Federation. Skelton has a knack for translating engineering topics into plain English, breaking down big, data-centric ideas into something digestible. 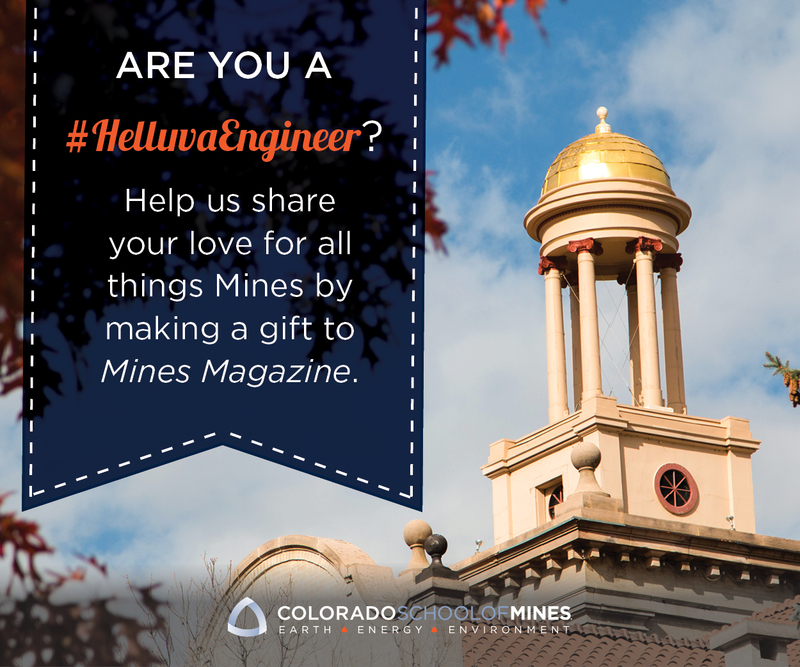 At Mines, she participated in EPICS and was a member of the Society of Women Engineers, the Minergy “renewal energy” Club and EarthWorks. Carol’s passion for environmental engineering includes water rights, pollution and the prevention of waterborne illnesses.